As you can see, the religiously unaffiliated has climbed from 14 to 21 percent over the past 8 years. And yes, I agree, this is great news, especially in a nation with a secular government and supposed equal rights for all. However, let’s not lose sight of the fact that various denominations of Christianity have been segmented here. 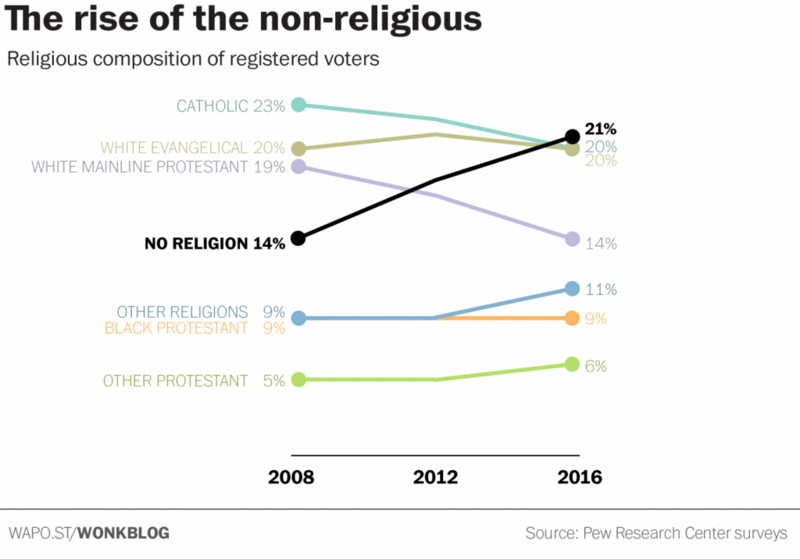 Catholics, white Evangelicals, white mainline Protestants, black Protestants, and other Protestants have been split up, but together make up 76% of registered voters in the US. So while a hefty 21% of voters claim no religion, more than triple that claim some version of Christianity. If the nones were divided up like the Christians are, we might see our number divided among atheists, agnostics, spiritual but not religious, believe in God but not affiliated, etc. So it’s all in how you represent it. As long as our 21% keeps growing, politicians will have to take notice and consider us when crafting their stump speeches. But we’re not a very powerful lobbying group, even though groups like the Secular Coalition for America and others are working hard to change that, and we’re severely outnumbered by those with cross-shaped torture devices hanging from their necks as jewelry. So I wouldn’t count on politicians pandering to secularists any time soon, but we are getting there, and hopefully will get much closer to being represented fairly in government in my lifetime. Like your blog! Thanks for a bit of good news.